When I decided to visit London, I secretly hoped that if I am lucky, I’d spot the TARDIS, Dr. Who’s infamous “bigger on the inside than on the outside” time machine. Thanks to Richard Bartle, my quest was not in vain. 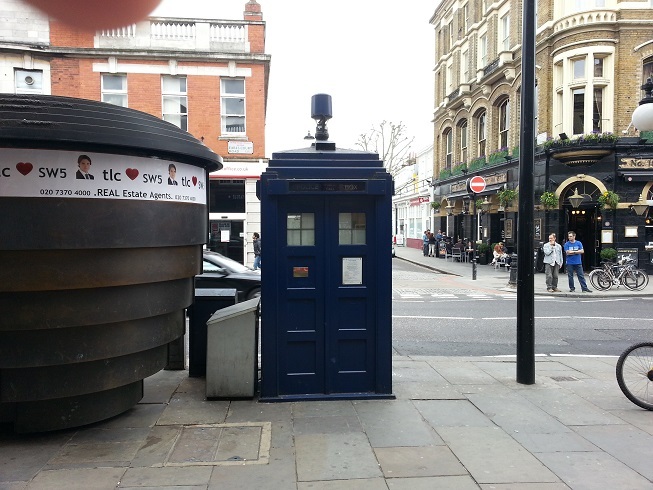 The TARDIS, as it turns out, is sitting quietly just outside one of the exits of the Earl’s Court Underground station. Except that… well, it’s not the real TARDIS. Instead, it’s just an ordinary blue police box, just like the one the TARDIS mimics, but unlike the TARDIS, this one is decidedly not bigger on the inside than on the outside. Still, it was fun to find.